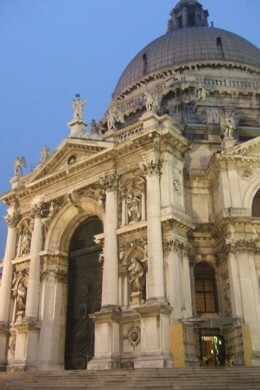 The lovely curvy shape of Santa Maria della Salute is one of Venice's most pictured landmarks. It stands on the final stretch of the Grand Canal, over the water from St. Mark's. Santa Maria della Salute was built 1631-1681 and dedicated to the Madonna in gratitude for the end of an outbreak of plague (the name means St. Mary of the Health). A contest was held to design the church, which was won by Baldassare Longhena, then in his twenties or early thirties. The church was an unusual shape at the time and is still striking today; taking the form of an octagon under a massive central dome. Once a year on the 21st November special masses are held to remember the city's deliverance from plague, and a temporary votive bridge is erected over the Grand Canal. The celebration is one of the most heart-felt in Venice, and is called the Festa della Salute. The exterior is a glorious confection in white: its fanciness not overpowering but suiting the location. The large stone scrolls buttressing the dome were an inspired touch. Inside, six side-chapels and the high altar open off the main space. The small side chapels contain paintings by Luca Giordano and one by Titian. The most interesting feature of the interior though, is its design and dramatic spaces. Some of the church's finer paintings are kept in the sacristy: follow signs to the Sagrestia, which is reached via a narrow passageway by the Titian painting in the main church. Entrance costs €3, which art-lovers will find worth paying. One of the highlights is Tintoretto's Nozze di Cana with its lovely light treatment of ladies with elegant braided fair hair. Another Titian hangs over the altar: a plague-referencing study of saints standing around for a chat in their identifying 'regalia': Sebastian in his loincloth with an arrow protruding from his ribcage; Rocco (Roch) with his bleeding plague sore; and doctors Cosmo and Damiano holding ointments and apparently discussing treatments. Above them Saint Mark is enthroned and looking aloof. There are more works by Titian on the ceiling; three Old Testament scenes (mirrors are provided to help visitors get a better view without craning their necks). There are sometimes free music performances in the church; for example organ vespers in the afternoon. Check information boards in the church or 'what's on' leaflets at the tourist information office for details. Entrance to this grand church is free (apart from the sacristy). Note that the building is closed at lunchtimes. Visitors are expected to behave and dress with decorum, as in all Italian churches. The church is closed at lunchtimes. The vaporetto stop Salute is right next to the church, just one stop across from San Marco/Vallaresso. The stop is served only by vaporetto 1.